Work is well underway across Dorset and Wiltshire to repair damage caused by flooding and coastal storms. In this blog we hear from Mark Goldingay about the work to repair damaged assets. Assets are banks, pumping stations, sluices, gates and coastal flood defences we maintain to help manage flood risk. After the biggest storms in25 years and the wettest winter on record, some of our flood defence structures were damaged and now need repairing. All of the repairs need to be completed before winter. We know this is a challenging deadline, but we are committed to reducing flood risk for people and properties ahead of this winter. My role is to plan and manage what needs repairing and where. 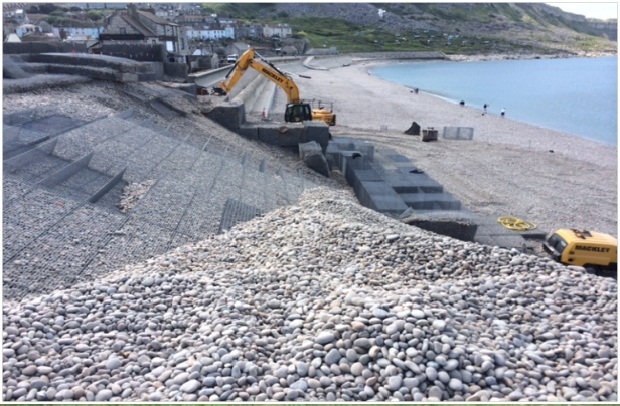 Some of the damage has already been repaired, including the sea defences at Preston Beach and Chesil Cove Sea Wall. We completed the sea wall repairs on behalf of Weymouth & Portland Council. I can still remember that iconic picture of The Cove Inn on Chesil beach being engulfed by a huge wave. Chesil beach took a pounding during the coastal storms last winter, and 150,000 cubic metres of shingle was lost from the beach that protects Chiswell. We have been busy ever since, initially replenishing lost shingle and more recently, repairing the gabion castle and crest protection mattresses. This work provides key protection to the community of Chiswell and the road connecting Portland to Weymouth. Other repair work that needs to be completed includes Wareham tidal bank repairs, Blandford pumping station and Allenview Culvert in Wimborne. I certainly hope that our fishing licence money is not going to pay for sea wall repairs, civil engineering work of that type should be paid for by the Government and local Councils. How do we anglers find out how our subs are being used and who is secretly dipping in the pot? we are a local sixth form who study this area as part of the A level geography course. Are you able to give me any idea of what the repairs cost, or how many hours/weeks it took to repair? Please send an information request to enquiries@environment-agency.gov.uk and the local team will be able to research the figures for you.